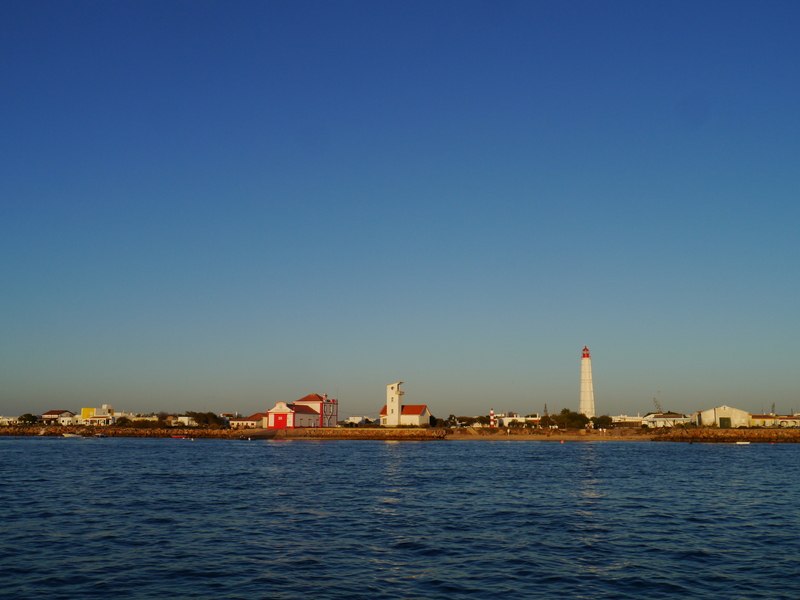 The islands just off Faro and Olhao are definitely top of our list of places we have visited so far, I think because they were such a change in landscape from the fishing towns and villages we had been in so far. Fishing was still very much the main industry but the backdrop was just so different. Having left Portimao in the early afternoon we were playing chicken with the sunlight as we arrived at the anchorage off the Ilha da Culatra. A popular spot for yachts in the summer there were still a lot around and we picked our way through them and dropped anchor. The anchor drag alarm went off a number of times but we didn’t seem to be doing anything more than moving around with the tide. Until that is about 1am when I noticed we really had moved quite a lot. Going up on deck I could see that we were drifting closer and closer to the catarmaran in front of us. They seemed to know we were coming too. Someone was on deck with a torch! Quickly we got the engine on, the anchor back up and attempted to anchor again. We stayed up most of the night anxious the anchor might slip again but it did us proud for the remainder of our stay. The next day our Dutch neighbour came over to say hello and we were able to apologise profusely for terrifying the life out of him in the middle of the night. Turns out he had only woken up because he’d had a strong coffee before he went to bed otherwise he would have been oblivious to the 14 tonnes of boat heading directly for him! Confident the anchor was holding we took a couple of trips over to the mainland town of Olhao. This would be our last stop in Portugal and we found lots of familiar features from our travels in the country so far: storks nesting on the church; mosaic pavements; tiny streets with tiled houses; swallow decorations. We managed to coincide with market day. We also found some brilliant street art in the back streets. The Ilha da Culatra was, however, very different. 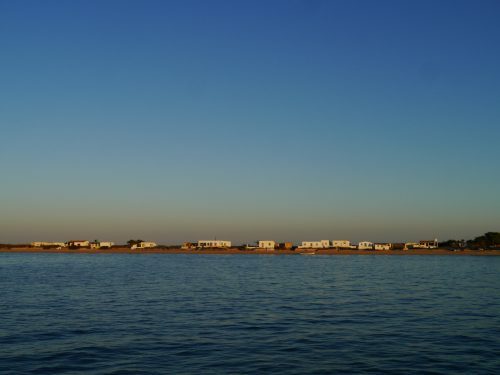 A tiny town with houses built on the sand between Olhao and the Atlantic. No roads, the only form of transport was the tractor. A wooden walkway took visitors all the way to the Atlantic side of the island and the beach. Everyone got around by water taxi – which gave no care at all to the wash they created for yachts anchored nearby. We got around everywhere in the tender. Here she is parked up in the tender park on one of our trips to the town. Fishing and tourism were very definitely their main industries. From the boat, with the changing tides, we watched the islands appear and disappear and the locals come out to fish their farms. In accordance with The Rules we noticed a local pie type thing in the shops and without knowing whether it was sweet or savoury we bought a small one to give it a try. It was an utterly delicious and very sweet swirl of pastry, sugar and cinnamon. The two of us polished it all off in one sitting! A little away from our anchorage and the town, we found our own deserted stretch of beach – deserted apart from this shoal of tiny fish all in a line along the shore. We tested out our new anchor for the tender and it worked pretty fine! From and to our anchorage off the Ilha da Culatra.